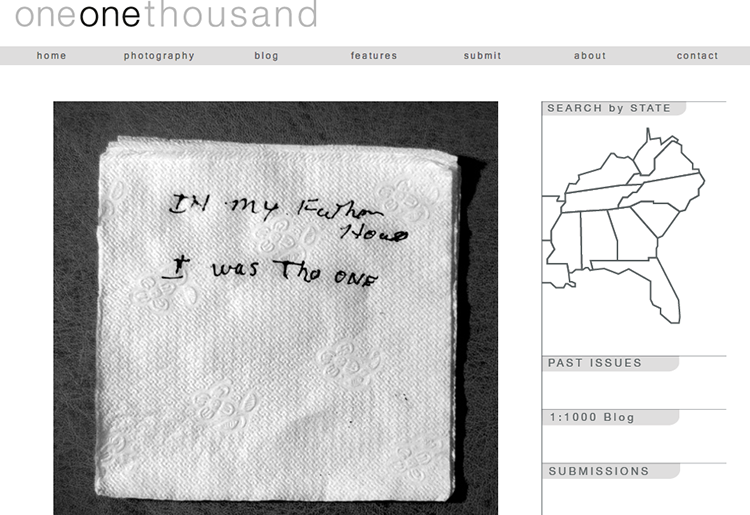 Today we profile the site One, One Thousand through a Q&A with co-founder Daniel Echevarría. Echevarría is a photographer and editor who lives and works in Atlanta, Georgia. fototazo: Why did you decide to start One, One Thousand? Where does the name come from? Daniel Echevarría: We conceived of the idea for One, One Thousand in early 2010, but the actual site didn't go live until the end of that year. Co-founder, Natalie Minik, and I had both moved back to Atlanta, and we were struggling to find artistic opportunities in the city. We wanted to create a platform for Georgia photographers to share their work. As we continued discussing the limitations present to photographers living outside of the United States' major art markets, we decided to expand our plan to cover the entire southeast. In my opinion, southern photographs—and even more specifically southern photographers—don't always receive adequate recognition. We wanted One, One Thousand to become part of a solution to that problem. The idea was to feature photographs, create some semblance of a regional community, and also to archive much of the great work being created in the south. The name "One, One Thousand" doesn't have anything to do with the south. While reading the foreword to Josef Albers' "Interaction of Color," I learned that Albers was particularly fond of a quote by the Victorian art critic John Ruskin: "The greatest thing a human soul ever does in this world is to see something, and tell what it saw in a plain way. Hundreds of people can talk for one who can think, but thousands can think for one who can see. To see clearly is poetry, prophecy, and religion, —all in one." We think of the photographers on our site as those "ones in thousands" who can actually see. f: Has running the site affected your sense of what "southern photography" is? Have you come to any conclusions as to tendencies, traits, or connecting elements that are more prevalent in photography of the region than in other parts of the US? DE: When we started the publication we didn't really know what to expect from "southern photography." Part of the reason we felt compelled to build the site was our limited knowledge of contemporary work in the region aside from some of the big-name artists like William Eggleston, Sally Mann, William Christenberry, etc. There really wasn't anything similar yet online addressing the subject. We had to get our hands dirty and research the photographers, projects, and organizations that had interests in the southeast. As the site initially grew, we tried to approach everything without any preconceived notions. For the most part, my definition of southern photography remains very open-ended. I live in a region that is constantly transforming, with a steady influx of immigrants and people from different parts of the US. Add to that the advances in technology and information distribution in last few decades, and this really ain't your mama's South. I think current southern photography reflects the South's changing dynamics in the 21st century. William Eggleston might have said it best, though, when he was asked about the topic: "I've had the idea always that it shouldn't be approached as pictures of the South. People down here get carried away by romancing the place." Nevertheless, I'd be lying if I denied noticing some trends during the past two years editing the site. I wouldn't go so far as to claim that certain themes currently dominate southern photographic practice, but photographers are definitely exploring similar ideas in unique ways. If you looked through a random sampling of the projects featured on One, One Thousand, you'd most likely find a few dealing with a search for home, a return to one's roots, or an attempt to understand place autobiographically. There are people much smarter than I am who probably have or should devote some scholarly research to these works. I can, at the very least, understand the desire to take on this subject matter because like so many other photographers in the region, I left and came back. f: Do you feel that a photograph or photographic project produced by someone who lives in the South that doesn't relate to the people, history, or landscape of the region and instead focuses on themes that are more universal is still in some way "Southern" and part of the definition of Southern photography? DE: I think I partly answered this in the last question, but if you need a pointed response, then, yes. It was never my intention to make One, One Thousand specifically about "southern" themes, but instead to examine the region by means of the actual work being created here. Richard Lou (who was featured on the site in August 2012) told me he thought One, One Thousand was a "creative asset map," and I think he hit the nail on the head. One of our goals was to make a resource so both photographers and the general public could see the great variety of work and the talent pool currently in the southeast. We do accept work by people who live in other regions of the country, but we primarily publish regional artists. In the past it's sometimes been a challenge to highlight more "universal" work, but I think that the longer One, One Thousand is around, the more diverse the collection of work on the site will become. I always encourage everyone regardless of style, content, or theme to submit. f: What are other institutions, online sites, galleries and magazines that people should know about that deal particularly with Southern photographers? f: Point us towards some photographers from or based in the South that you are interested in currently. DE: I think all of the photographers featured on One, One Thousand are more than worthy of increased attention and interest, so I'd point you to any of them without a second thought. I understand that's not really a satisfying answer, though, so here are 3 southern photographers who continue to surprise me and who I eagerly look forward to seeing their new work: Deborah Luster, Mark Steinmetz, and Susan Worsham. f: Where is the site going? What are your plans for 2013? DE: It almost feels like 2013 is going to wrap up before I can fully deliver on many of the plans I had for the site at the beginning of the year. This isn't my full time gig, so it's always difficult to manage work, artistic ambitions, personal life, and leave time for One, One Thousand. Still, it's a labor of love and I'm always tinkering, trying to make it better. A big change in the last year has been the lower frequency of blog posts highlighting photo shows, grant opportunities, photography books, etc. That kind of information can more easily (and perhaps even more effectively) be shared on social media. I generally want the website's non-photography pages to include more nuanced and long form articles and series. I've also begun collaborating with universities to feature more student work, and I'm interested to see how that keeps going. Another goal is continuing to grow our audience. I always knew that southern photography was going to attract a somewhat niche community, but the work on the site truly deserves to be seen by more eyes. In terms of the website's backend, I'm currently working with an excellent developer and friend, Ben Brodie, to update One, One Thousand for Web 2.0. I'm hoping for greater functionality on desktop and mobile, and just a better user experience overall. One, One Thousand was always designed with the web in mind, and as that medium changes, we have to change with it.